Obamanomics is the term given to those aspects of President Barack Obama’s policies that affect the economic and fiscal well-being of the American public and the nation. Obamanomics is the term given to those aspects of President Barack Obama’s policies that affect the economic and fiscal well-being of the American public and the nation. Foremost among those policy initiatives is ObamaCare, more formally known as The Patient Protection and Affordable Care Act (PPACA), a federal statute that was signed into law by the president on March 23, 2010, and the Health Care and Education Reconciliation Act of 2010, which was signed on March 30, 2010. In addition, the stimulus package, Cap & Trade, and the possibility of a value-added tax (VAT) contribute to the concept of Obamanomics. All these policy initiatives — and the tax increases that will be necessary to finance them — are a threat to individual families’ finances; they are also a threat to the nation’s economic strength, contribute to the financial crisis, and vastly increase the federal debt that economists predict will add to the already existing mountain of debt that promises to burden generations of Americans into the foreseeable future. The government now owns 51 percent of the private sector. The majority of Americans disapprove of the “changes” and “transformations” that Obamanomics is imposing on American taxpayers. In the past, government programs have failed miserably and on a massive scale. Women and families bear the brunt of Obamanomics’ income redistribution. Current Internal Revenue Service (IRS) regulations have nearly seven million words (up nearly 20 percent since 1995). The typical family pays 30 percent of its income for taxes (more than for food, clothing and housing combined). Americans spend an estimated $110 billion in complying with tax laws and filing tax forms. Tax Freedom Day calculates that the average American works for the government from January 1 to April 8 in order to pay their taxes. Married couples could be paying as much as $10,000 more for being married. It will encourage cohabitation and divorce because of increased insurance premiums and fees for being married. It will discourage married women from working because of higher tax rates. Young married couples and empty nesters will be hit especially hard. Financial affects are perpetual and, thus, cumulative. ObamaCare increases the magnitude of the disincentives for marriage. By encouraging single parenting, the bill will increase poverty. 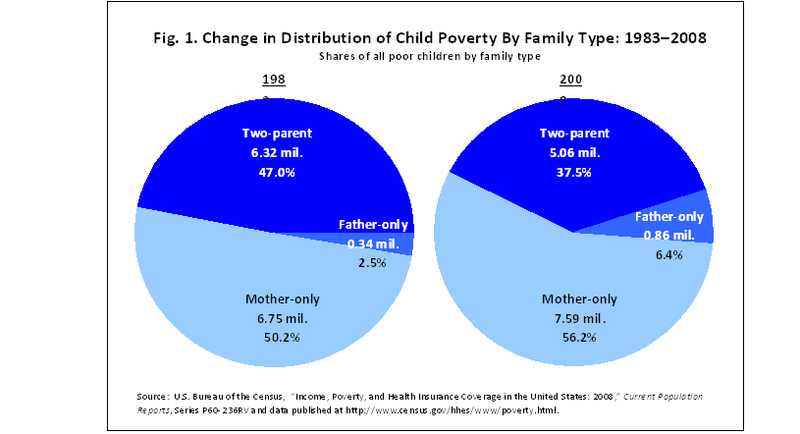 The rate of poverty for married couples with children is 7.5 percent (in 2008). The poverty rate of single mothers with children is five times higher than for married couples with children. The poverty rate for single fathers is almost 2.5 times higher. Poor children in single parent households constitute almost two-thirds of all poor children. It rewards the 70 percent of unmarried women who voted for President Obama in 2008. The majority of taxpayer-stimulus jobs went to women, even though men suffered the majority of job losses during the current recession — costing taxpayers trillions of dollars per year. Current welfare programs cost almost $1 trillion per year (twice as much as national defense, and nearly the size of the federal deficit). ObamaCare is projected to add another $2.5 trillion to the cost of welfare programs. ObamaCare is a boondoggle for older, unmarried mothers (in their 20s and 30s) who, rather than teenagers, are driving the out-of-wedlock birth rates. Prior to its passage, President Obama was willing to “put everything on the table” to get ObamaCare passed, except for abortion. Taxpayer funding of abortion is in the health care reform bill. ObamaCare funds community health centers — including Planned Parenthood clinics — that provide abortions. ObamaCare does not protect the conscience rights of health care providers. The American taxpayer has been protected against having their money used to pay for abortions by the Hyde Amendment that has been in effect since 1976. At the state level, 33 states had abortion funding limitations, four funded elective abortions, and 13 funded abortions for lower-income residents. Federal and state level battles over taxpayer funding of abortions are inevitable. People on Medicare and Medicaid, mostly women, will receive less care and possibly worse care. ObamaCare will increase Medicaid by bringing in one in five (16 million) Americans. It will move younger and healthier individuals out of private insurance, thus making private coverage more expensive for small business and their workers. More than 10 million seniors will lose their Medicare Advantage (about 50 percent will be driven out; those who remain will pay more). Changes in Medicare and Medicaid are the biggest drivers of the massive increases in the national debt. Medicare and Medicaid beneficiaries will likely get a lower standard of care. The long-term viability of Medicare reductions is doubtful. More and more doctors are opting out of Medicare because their operating costs exceed their reimbursements. Increased Medicare and Medicaid costs will increase health care spending by $311 billion over the next decade. Fines will raise $4 billion in taxes, 76 percent of which will be paid by those making less than $120,000 per year. An estimated 14 million will lose their employer-based coverage, leaving more than 21 million without insurance. Employers hiring low-income employees (high school dropouts, minorities, and women) will be penalized. Women-owned businesses will be hard-hit by the insurance burden they will face. Women dependent upon their husband’s insurance coverage, and divorced or widowed women will be vulnerable. Single moms (who are supposed to be the primary beneficiaries of ObamaCare) are more likely to be out-of-work because of policies affecting small business owners. Keeping young adults up to age 26 on parents’ policy extends adolescence and dependency. Businesses, (especially small businesses) are likely to pay huge fines ($87 billion) in the first five years. Employment of low-skilled workers will decline, higher-skilled workers will see cuts in take-home pay, and employment prospects will dim for millions of Americans. Businesses and production industries will be at a competitive disadvantage internationally. Women, employed disproportionately in small businesses, will be especially hard hit. America’s debt is trending to reach 100 percent of Gross Domestic Product (GDP) by 2019-2022. The president’s own actuary showed that reductions in the cost of ObamaCare would be more than offset by higher expenditures, that it is “plausible and probable” that prices will increase. Hospital budgets will be driven into deficits by Medicare overages, thus negatively affecting access to care for beneficiaries. Hundreds of new commissions, boards, and agencies are created by the law. Increased bureaucracy will further distance patients from doctors. U.S. Department of Health and Human Services (HHS) estimates (available, but not made public before the vote on the bill) indicate nobody knows what ObamaCare will cost. The Congressional Budget Office (CBO) reports penalties amounting to $1,000 per person. Fines will total more than $4 billion between 2017 and 2019. ObamaCare has $2 trillion in higher taxes, doubles the debt in five years, and triples the debt in 10 years. ObamaCare is the largest entitlement in 35 years, with the majority of Americans more dependent upon the government than on themselves. More than 70 percent of Americans get more benefits from government than they pay for in taxes. The public’s trust in government is at a “historic low” (less than 22 percent). The president’s approval rating is at a 44 percent low, and Congress’s is at 25 percent. The true cost of government ($9 trillion) is out-of-control. There is a built-in mechanism that will force people into government-controlled insurance coverage. This year, America’s national debt will reach 63 percent of the GDP. Over the next decade, ObamaCare is expected to add $10 trillion to America’s already staggering debt. The U.S. debt is predicted to be at 90 percent of GDP by end of this decade and 100 percent by 2019-2022. Economists consider 90 percent a crisis. Interest rates alone for ObamaCare will total $5.6 trillion. The deficit now concerns Americans more than unemployment. Economists predict that rich Americans could end up paying 90 percent of their income in taxes. Women are the fastest growing segment of the veteran population. Cuts to Medicare Part B will especially hurt military retirees. Doctors are already refusing to accept Tricare, so will likely reject new Medicare patients, too. Pentagon spending on health care has increased 167 percent since 2010 (when it was $19 billion) and is expected to increase to $50.7 billion in 2011 (twice as fast as for the regular population). As a share of defense spending, health care costs have jumped from 6 percent to 9 percent. Around 10 percent of service members show signs of post-traumatic stress disorder. Heavy alcohol use is higher for service members than for civilians. Behavioral counseling needs have increased by 65 percent since 2004. Mental health issues and joint problems have increased from 2.8 million in 2005 to 3.7 million in 2009. ObamaCare is the government’s biggest attack on economic inequality in three decades. ObamaCare contains $670 billion in tax increases. Tax increases hurt women because they discourage job creation — more women than men exit and enter the labor force. Tax structure already discourages married women from working. ObamaCare includes at least 14 different tax increases that target taxpayers earning less than $250,000 per year. Massachusetts’ health care reforms (similar to ObamaCare) prompted more than half-a-dozen lawsuits to stop double-digit premium increases. Attorneys General in more than a dozen states are working to challenge the legal mandate in federal court as unconstitutional. Another tax initiative, The Financial Regulatory Bill, establishes a new bureaucracy — the Office of Financial Research— with subpoena power to collect financial information. The Financial Stability Oversight Council will monitor the entire “financial services marketplace” and recommend new financial regulations. The Internal Revenue Service has a new initiative targeting “high wealth individuals” that has been criticized for globalizing tax administration. Because women control the majority of financial assets in the U.S., own 40 percent of the $5 million-plus estates, constitute 47 percent of Americans with assets over $500,000, and control more than half of private wealth, they will be disproportionately affected by tax increases. Over the next decade, there are dozens of tax increases scheduled to automatically go into effect unless Congress intervenes. There are signs that the U.S. is headed toward a value-added tax (VAT), probably to be implemented after the 2012 election if President Obama is reelected. Paul Volcker, former Federal Reserve Board Chairman and now chairman of President Obama’s Economic Recovery Advisory Board, and other top Democrats have indicated that a VAT would solve the financial crisis in the U.S. The Senate went on record opposing a VAT by an overwhelming vote (85-13). President Obama has changed his rhetoric about not imposing any tax increases on families making less than $250,000. He now says merely that he won’t raise “income” taxes. VAT would raise $500 billion a year and cost each household over $4 thousand a year. Most European countries have a VAT that averages 20 percent. VATs set up a culture battle between dependency and independence. VATs hit the poor harder than the middle class or rich. VAT classifications are determined, sometimes arbitrarily, by bureaucrats leading to unintended consequences. Fig. 1. Change in Distribution of Child Poverty By Family Type: 1983–2008, p. 11. Fig. 2. CBO Estimates of National Healthcare Expenditures: 2010–2019, p. 18. Fig. 3. Federal Government Debt Held By Public: 1994–2020, p. 25. Under the Obama Administration, the Democrats are unleashing a bevy of unpalatable surprises for women, including massive up-front government expansions and enormous tax increases that produce problems for American women and their families. As Rep. Michele Bachmann (R-Minnesota) recently said, “The government now owns 51 percent of the private sector.” In just 18 months, the current administration has produced extraordinary “change”; indeed, it threatens a huge “transformation” of America. The majority of citizens not only disapprove of these “changes” and “transformations,” they actively oppose them. Citizens have picketed, protested, held town halls to express their opposition, and responded to poll after poll indicating their overwhelming opposition to the actions of the Democrat majority and the socialist agenda of the President. Controversy and secrecy surrounded the passage of ObamaCare, but the incident with Joe Wurzelbacher, a plumber in Holland, Ohio, kept echoing in reports and analyses of the bill. Obama, the candidate, said, “I think when you spread the wealth around, it’s good for everybody.” That off-the-cuff remark stayed in critics’ minds, 4 even when the President and the Democrat-controlled Congress suppressed open debate and the media focused on other aspects of the bill. Now that the bill was rammed through and the President has signed it, Democrat politicians, from Senator Max Baucus to Vice President Joe Biden, are remarkably open about the real purpose of the bill.5 — to spread the wealth around. Trouble is, women and families are the ones who bear the brunt of Obamanomics’ income redistribution. With the specifics of the legislation a closely-guarded secret known only to the liberal elite in Congress while it was under deliberation, it was not immediately clear that women and families were the ones bearing the brunt of the new taxation hidden in ObamaCare. Supporters didn’t talk about the bill’s marriage penalty — the fact that it will redistribute wealth from married couples to cohabiting couples. 6 They also didn’t mention the fact that “people on Medicare and Medicaid, disproportionately women, would receive less care and possibly worse care.” 7 Plus, nobody talked about the fact that the bill penalizes those employers that hire low-income workers, primarily single mothers and housewives needing a second income. 8 So, instead of encouraging single mothers to marry the father of their children and to become financially independent by facilitating job growth, ObamaCare creates another avenue of dependency through health insurance subsidies. Another issue lies with the impending tax increases and the growing burden on Americans to comply with the federal tax code. According to the IRS’s Taxpayer Advocate Service, “The Code has grown so long that it has become challenging even to figure out how long it is.” Their best estimate is that it contains approximately 3.7 million words. The Tax Foundation reported that the Internal Revenue Service (IRS) regulations currently have nearly 7 million words $mdash; an 18.7 percent increase since 1995 and, amazingly, almost nine times the total number of words in the King James Bible. Compliance with the IRS regulations is a major burden on American citizens. Further, the Tax Freedom Day group acknowledges that the average American works for the government from January 1 to April 8 — a full 99 days — in order to pay his or her taxes. And we haven’t seen anything yet. Unless Congress takes action or the results of the 2010 election shift the power dynamics in Congress after November, Americans face unprecedented tax increases from 2010 through 2013. ObamaCare means a new tax will disproportionately fall to lower and middle income couples who choose to get married rather than just live together. The House Republicans gave an example of an unmarried couple, each earning $25,000, for a total income of $50,000 who would pay annual health insurance premiums capped at $3,076. The Congressional Budget Office estimates that about 17 million people would receive such subsidies in 2016 under the House health care bill. A married couple with the same combined income, $50,000 a year, would pay premiums capped at $5,160 — a “marriage penalty” of $2,084. House Republican Leader John Boehner of Ohio agreed that ObamaCare’s marriage penalty could cost couples that choose to get married “thousands of dollars” in higher insurance costs. “Under the Senate bill, married couples in general would receive between $1,500 and $10,000 less in government health care support than would cohabiting couples with the same total income. Stacy Dickert-Conlin, an economics professor at Michigan State University, explained, “You might like to have [the Health Care Reform Bill] be progressive, equitable and marriage-neutral. 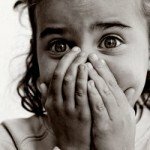 But you have to decide what your goals are, because you can’t accomplish all three.” 22 Those who designed ObamaCare were willing to sacrifice marriage for the sake of seeming to be “progressive and equitable,” even though social science research reveals a clear link between single motherhood and poverty. The message is painfully undeniable and unequivocal. There is no way to address poverty in America without addressing the problem of single mothers and absent fathers. Yet, the Health Care Reform Bill that was just rammed through by the Obama Administration does exactly the opposite: ObamaCare ramps up the subsidies promoting single motherhood and discouraging marriage. These subsidies are just one more of the numerous financial incentives in current government policy that increasingly encourage individuals to reject marriage — the Earned Income Tax Credit (EITC), housing subsidies, food stamps, child support payments, and the welfare dependency programs that created and sustained the inner city matriarchal culture. The president tried to protect the renegade pro-life Congressmen with an executive order that pretended to reverse the bill’s provisions. It changes existing law by allowing federally subsidized health care plans to pay for abortions and could require private health insurance plans to cover abortion. It imposes a first-ever abortion tax — a separate premium payment that will be used to pay for elective abortions — on enrollees in insurance plans that cover abortions through newly created government health care exchanges. “One can support or oppose the government funding abortion. But that isn’t the point. If we are to have any respect for law and ordered liberty, our legislation must honestly describe what is intended and allowed. Otherwise, people can’t fully judge whether or not they approve of what their representatives have done and may not even understand what the law requires or permits. In a speech at the end of 2009, President Obama promised that his health care reforms would “strengthen Medicare and extend the life of that program.” Instead, the Associated Press reported that the plan’s cuts to Medicare “could drive about 15 percent of hospitals and other institutional providers into the red,” possibly jeopardizing seniors’ access to health care. Further, Health and Human Services (HHS) determined that the cuts may be “unrealistic and unsustainable.” 56 Richard S. Foster, Medicare’s chief actuary who is responsible for long-range cost estimates, determined that the “longer-term viability of the Medicare reductions is doubtful.” The really bad news in the HHS report is an expected exodus of about 50 percent from private Medicare Advantage plans because of projected reductions in payments; those who continue traditional Medicare will likely face higher out-of-pocket costs. In addition, a new voluntary long-term care insurance program created under the law faces “a very serious risk” of insolvency. 57 Physicians are paid for seeing Medicare patients according to a formula called the Sustainable Growth Rate (SGR). Intended to be updated every year, the SGR has not been adjusted for the costs of technological innovation or the expansions in benefits like cancer screening or diabetes management. In another blow for the White House, two government agencies charged with analyzing the costs of ObamaCare reported that the new law will raise health care costs substantially instead of reducing costs. The Office of the Actuary of the Centers for Medicare and Medicaid Services declared that the healthcare “reform” legislation will not, as President Obama repeatedly promised, reduce healthcare costs. Instead, ObamaCare will “increase national health care spending by $311 billion” over the next decade (see Figure 2). Women are starting new businesses and stimulating new jobs “at a rate that outdistances their male counterparts and disproportionately exceeds their current contribution to U.S. employment.” 64 A new report from The Guardian Life Small Business Research Institute predicts that women-owned businesses will create one-third of the over 15 million new jobs expected by 2018. 65 With ObamaCare, these rosy predictions are unlikely to materialize as the insurance burden on small businesses crushes entrepreneurship. Sadly, ObamaCare includes an “insurance tax that is not only costly, but also unfair to those workers [mostly women] who are employed disproportionately in small businesses.” 72 Fully 88 percent of workers in small businesses (3-199 employees) are in fully insured plans and would be subject to the tax, while only 14 percent of workers in large companies (over 5,000) employees would be subject to it. Reality vs. Rhetoric — Americans are learning that ObamaCare will pile on to an already insurmountable debt and cause government to encroach on every area of our lives. 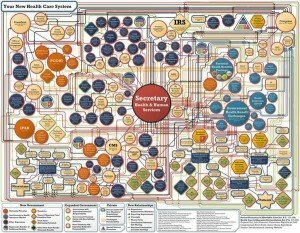 Indeed, ObamaCare is an “unmitigated disaster — for our health care system, for our fiscal future, and for any notion of limited government.” 73 Clearly, with America’s debt on track to reach 100 percent of Gross Domestic Product (GDP) by 2019-2022, it is way past time to have an accounting of the costs of ObamaCare. And, the more we learn about the specific provisions, the more we discover that the bill does not reflect our values — faith, family, and freedom $mdash; nor does it strengthen those principles that are the foundation of a great nation. While Democrats are crossing the country to declare that ObamaCare is not a government takeover of health care, they must realize that 148 new commissions, boards, and agencies are created by the bill. In another troubling aspect of the government takeover of health care, the bureaucrats that will staff those additional government entities will be another barrier between the patient and his or her doctor. Many Americans were outraged after ObamaCare passed when a report from the Office of the Actuary of Medicare indicated that the costs of the bill would increase rather than cut the costs of health care in the United States. Phyllis Schlafly lamented that America is becoming a “two-class society” — “those who pay for the services provided by the government and the freeloaders.” 75 Schlafly explained that 47 percent of Americans will pay no income tax; the bottom 40 percent will not only pay no income tax, they will receive cash benefits (financed by those who do pay taxes). Worse, the top 10 percent of Americans will pay 73 percent of the total that the federal government receives through income taxes. Numerous polls indicate that the public’s trust in government is at an “historic low.” Many Americans instinctively knew that ObamaCare included a “gotcha” buried deep inside. 87 The Pew Research Center reports that 22 percent of Americans trust government today. A Quinnipiac poll notes that the President’s approval rating is down to 44 percent, and Congress’s approval is 25 percent. Daniel Henninger of the Wall Street Journal said, “The American people have issued a no-confidence vote in government.” 88 Henninger thinks that the distrust is because with almost universal access to the Internet the “veil was ripped from the true cost of government” so that everyone could see how drastically spending was out of control — a total of more than $9 trillion, an amount most people have no context for comprehending, but that the majority of Americans realize will be impossible to pay in their or their children’s lifetimes. All of these costs underestimate the cost of ObamaCare. As explained by James Capretta, two workers with identical incomes would be treated very differently — job-based insurance coverage would cost considerably more than the “exchange” coverage subsidies to low- and moderate-wage workers. Ultimately, then, the entitlement would get extended to everyone. 89 In other words, there is a built-in mechanism to force people into government-controlled insurance coverage. $10 trillion — Amount Obama budget will add to the national debt in the next decade. $5.6 trillion — Amount interest costs alone will consume this decade. 63 percent — Debt-to-GDP ratio this year (see Figure 3). Military Health Care Costs— While the Democrat Armed Services Chairman and officials in the Veteran’s Administration try to reassure military personnel against “unfounded fears,” there is plenty for knowledgeable service men and women to worry about. The more than 26 million U.S. veterans realize that ObamaCare will have a profound impact on their health care. As one writer expressed it, “Every single living veteran, past, present, and future who seeks medical tests, undergoes surgery, wears a prosthesis, or has any kind of implant will be affected.” Premium increases and benefit decreases have already begun, and servicemen are already seeing “strained reimbursement rates.” 105 Cuts in Medicare Part B will especially hurt military retirees; veterans are already finding that doctors no longer accept Tricare or will not accept new Medicare patients. Tax Increases — The federal stimulus package was supposed to alleviate the financial crisis, but it didn’t. As New York’s Democratic Lt. Gov. Richard Ravitch notes, “The stimulus package just raised higher the cliff from which we all will have to jump off.” 109 The only thing left, then, was tax increases in order to implement the President’s agenda, especially so-called health care reform. ObamaCare contains $670 billion in tax increases. These increases will “discourage job creation and investment” and “that will hurt women more than men because women exit and enter the labor force more often.” 111 In addition, the tax structure already discourages married women from working. “Far more than men or single women, married women act like supply-siders. Cut their marginal tax rates, and they get jobs. Raise their taxes, and they stay home.” 112 For the middle class, there are at least 14 different tax increases signed into law that target taxpayers making less than $250,000 per year. In addition to the tax increases in ObamaCare, there are other tax initiatives that do for tax what ObamaCare does for health care. The financial regulatory bill (which passed the Senate Banking Committee and is a top priority for Congressional Democrats) establishes a new bureaucracy — the Office of Financial Research — with subpoena power to collect information from “any financial company” to determine whether there is a risk to financial stability. 115 The new office would support the nine-member Financial Stability Oversight Council that would monitor the entire “financial services marketplace” and recommend new financial regulations. 116 This gigantic increase in government bureaucracy will doubtless produce reams of paperwork that will add to financial stability problems rather than contribute to their solution. 70 percent of women earning more than $100,000 earn more than their husbands. 40 percent of estates worth more than $5 million are controlled by women. Women constitute 47 percent of individuals with assets over $500,000. Women control 51.3 percent of private wealth in the United States. Taxpayers will no longer be allowed to deduct state and local taxes from their federal income tax. Business tax credits for research, experimentation and development will no longer be deductable. Nor will tuition and related expenses be deductable, nor will school teachers be able to deduct books and other supplies bought with their own money. Farm Machinery and equipment depreciation will no longer be deductable. Personal capital gains tax will increase from 5 percent and 10 percent to 10 and 20 percent. The child tax credit will decrease from $1,000 to $500. After years of decreasing “death” tax rates, they will return to the “stepped up” basis. The dependent care tax credit will decreased from $3,000 to $2,400. The Work Opportunity Tax Credit will expire. (Allowed employers to deduct 40 percent of first year wages of a new employee). The adoption tax credit will decrease dramatically (from $13,170 to $5,000). Value Added Tax (VAT) — There is an “emerging consensus” that we are headed for a Value-Added Tax (VAT) in the United States. But the more optimistic among the experts and pundits believe it won’t come until after the 2012 election and then only if President Obama is reelected. There is no doubt that something will have to be done about the financial crisis and the federal debt — even if ObamaCare is repealed — and many believe the “hidden” VAT is the politically viable solution. Many openly say that the VAT, with its costs hidden in the price of commercial products, is the only way to get the money to pay for ObamaCare. Paul Volcker, former Federal Reserve Board Chairman and now chairman of President Obama’s Economic Recovery Advisory Board, predicted that a VAT would be the solution to the financial crisis and insisted that the VAT is “not a toxic idea.” Other Democrat leaders have weighed in advocating the VAT, including House Speaker Nancy Pelosi (D-California), Sen. Kent Conrad (D-North Dakota), White House advisor Ezekiel Emanuel, and John Podesta, head of the Center for American Progress. The Senate recently opposed the creation of a VAT by an overwhelming vote (85-13). The non-binding resolution stated that the VAT “is a massive tax increase that will cripple families on fixed income and only further push back America’s economic recovery.” Of course, President Obama promised there would be absolutely no tax increases for families making less than $250,000 per year. But, Americans for Tax Reform reports that President Obama recently changed his rhetoric — just slightly — to say that he won’t be raising “income” taxes on families. President Obama has also gone on record telling his debt commission, The National Commission on Fiscal Responsibility and Reform (NCFRR), that “everything is on the table” when it comes to ways of reducing the nation’s $1-trillion-plus federal deficit. The NCFRR is an 18-member commission co-chaired by former Clinton White House Chief of Staff Erskine Bowles and former Republican Sen. Alan Simpson of Wyoming. The NCFRR will be presenting their recommendations to the president by December 1, 2010 — conveniently after the November elections. The commission was told to recommend ways to reduce the federal budget deficit from 10 percent to three percent of the GDP by 2015 and to submit solutions for cost containment of Social Security and Medicare. Indeed, the more we learn about the VAT, the less attractive it is. Clearly, VAT is not the solution; the problem is not a revenue shortage, but government over-spending. The financing for this debacle can be summarized briefly: “The president intends to squeeze an extra $1.2 trillion over 10 years from a tiny sliver of taxpayers who already pay more than half of all individual taxes. It won’t work.” 132 Economists explain this through the ETI principle — the elasticity of taxable income: when marginal tax rates go up, the amount of reported incomes goes down. In other words, the rich know how to avoid paying excessive taxes. The great irony of ObamaCare is that Americans overwhelmingly oppose the bill. Most Americans report that they are satisfied with their current health care coverage; more than in Canada. 138 This bill, which puts the nose of the federal government under the tent and into the most personal aspects of citizen’s lives, was rammed through by those who supposedly are the privacy champions. Poll after poll reveals the public’s opposition, not just to the costs, but also to the bill’s “specific adjustments that shift power and control away from the individual and place them in the hands of the federal government.” 139 Scott W. Atlas ended his Forbes article with a succinct statement of the health care dilemma. The result of all the debate and the Congressional shenanigans is that most American voters believe that ObamaCare will drive costs up and reduce the quality of American medicine. 141 The American public wants health care reform that will treat people fairly without driving up costs or undermining the world-class quality of U.S. health care. It is likely that future elections will ultimately reflect this reality. Janice Shaw Crouse, Children at Risk: The Precarious State of Children’s Well-Being in America, (New Brunswick, NJ: Transaction Publishers, 2010), 35. Crouse, Children at Risk, 47. Crouse, Children at Risk, 13. Crouse, Children at Risk, p. 36 and U.S. Bureau of the Census, “Income, Poverty, and Health Insurance Coverage in the United States: 2008,” Current Population Reports, Series P60-236RV published at www.census.gov/hhes/www/poverty.html. Crouse, Children at Risk, 42. Crouse, Children at Risk, 39. Ezra Klein, “Health-care reform and women,” The Washington Post, March 18, 2010. Martha Barletta, Marketing to Women, (Chicago: Dearborn Trade Company, 2006): 8. Martha Barletta, Marketing to Women.